Sauchuk's Corn Maze and Pumpkin Patch in the town of Plympton said Sunday that its 10th corn maze will feature the New England Patriots' star quarterback. 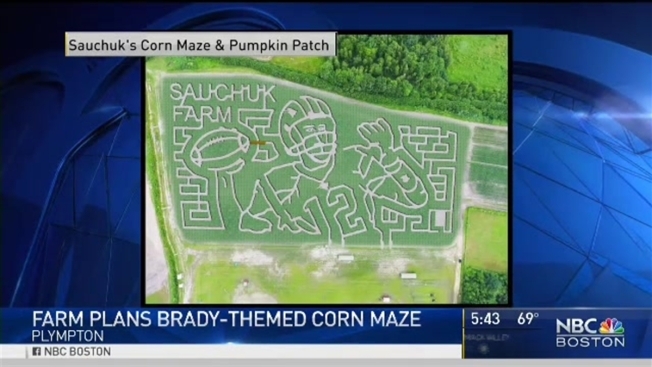 A Massachusetts farm is honoring Tom Brady with a corn maze designed in his image. The maze will open Sept. 16. The design has been unveiled on the farm's Facebook page. Boston.com reports the crops won't be fashioned into the shape of Brady until closer to the farm's opening day. Farm owner Scott Sauchuk plants and grows the corn, which he says is a 90- to 100-day process. A company will then spend one day chopping the corn into the desired shape. Sauchuk says the decision was based on the Patriots' Super Bowl victory over the Atlanta Falcons earlier this year.